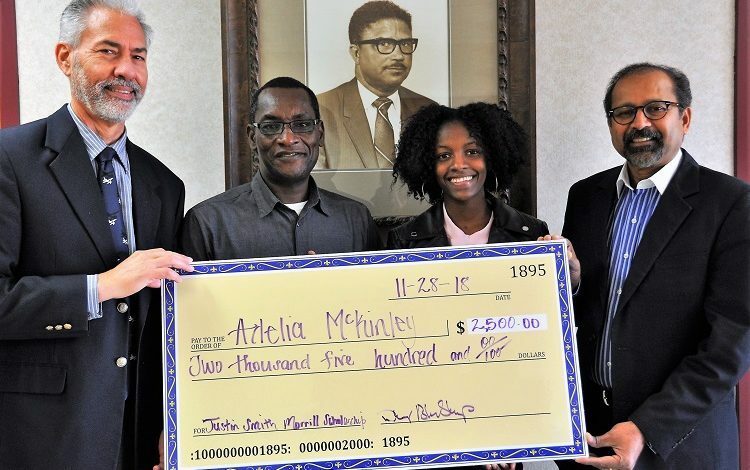 The 21-year-old Jamaica native recently received a $2,500 Justin Smith Morrill Scholarship from the 1890 Universities Foundation to help with school expenses. Dr. Mohammed Ibrahim, FVSU’s coordinator and professor of the agricultural economics program, nominated her for the competitive award. With a 3.93 GPA, McKinley plans to graduate in May 2019. She said part of her career goal is to work for Land O’Lakes Inc., a leading agribusiness in America. After interning at the Minnesota headquarters for two years, she has already accepted a job offer with the company in the Midwest. McKinley will work in a rotational distribution management training program her first year. “It’s a very intense training. After that, I will be a manager for one of the WinField United distribution centers,” she said. “It’s very exciting. I got this offer in August after my internship. I was very happy to start my senior year already having a job. That took off a lot of stress. I don’t have to worry about what I’m going to do. It’s a blessing.” McKinley was more than willing to relocate. “That’s one of the perks,” she said. The Riverdale High School graduate plans to serve in this management position for about five years and then pursue her Master of Business Administration. She eventually wants to return to the corporate office, as well as explore entrepreneurship. Heavily involved on FVSU’s campus, McKinley serves as a Thurgood Marshall College Fund campus ambassador and is a member of Minorities in Agriculture, Natural Resources and Related Sciences (MANRRS) and Alpha Kappa Alpha Sorority. She is also a former member of FVSU’s Student Government Association and recently represented the university as a 2018 White House Initiative on Historically Black Colleges and Universities Competitiveness Scholar. In addition, she is gaining research experience by investigating the demand for goat meat in the southern United States. McKinley said her key motivation is self-discipline. “I’ve always been like this. Different things motivate me at different times,” she said. The senior Wildcat said she has never looked back since being introduced to different sectors of agriculture her junior year of high school and to the agricultural economics program at FVSU. “I’m satisfied. I’ve accomplished every goal that I set out to accomplish my freshman year, plus more,” she said. The 1890 Universities Foundation is a nonprofit organization created to support the core missions of teaching, research and Extension across the 19 1890 Land-Grant Universities.